It’s always a good time in the movie theater when an all-star cast gets to really interact with each other, especially when the film concept is as fun as Red 2. It’s doubly entertaining when the cast is so seasoned, with a wealth of experience to draw from and a history of work attached to their familiar faces. But big names will only carry a movie so far; the film still has to be coherent and entertaining in its own right. Red 2 does manage to fall on the entertaining side of the spectrum, but, sadly, only in a distracting sort of way. Retired CIA agent Frank Moses (Bruce Willis) tries to enjoy his domesticated life with girlfriend Sarah (Mary-Louise Parker) after the harrowing events of Red. His retirement, unfortunately, is short-lived when Marvin (John Malkovich) tracks Frank down to warn him that shadowy players are moving against him and his old crew for their alleged involvement in a covert operation many decades ago. Now governments around the world, including his own, want Frank’s head, which reunits him with old friends like MI6 sniper Victoria (Helen Mirren) and Russian operatives Ivan (Brian Cox) and Katja (Catherine Zeta-Jones), but also pitting him against new enemies like world-class hitman Han Cho Bai (Byung-hun Lee). Sarah, sensing adventure that can revitalize her stagnating relationship with Frank, urges him to involve her in the mission to get to the bottom of their deadly predicament. Together, Frank and friends must travel the globe to clear their names, but what they stumble on is a plot that could mean the destruction of countless lives. Fans of the original Red should be very pleased with this sequel; it retains everything that made Red entertaining – ironic humor, over-the-top action set pieces and intriguing espionage. This time the film ups the ante with a global plot that requires the heroes to travel around the world. Like the previous film, however, Red 2 also lacks in all the same familiar ways, like in character development and dramatic tension. Placing characters in life and death situations is fine for a spy film, but to play those moments up so melodramatically when audiences intellectually understand that the character can’t die since there is so much more runtime to get through is a frustrating experience. The lack of character exploration is particularly disappointing here, considering that this is the second film in the series and the filmmakers are free from the burden of an origin story. In the beginning of the film, Sarah seems bored with the normal life and relationship she has with Frank, so when the opportunity to put Frank and herself in danger presents itself, she’s all too eager to embrace it. From the start her reckless behavior makes her an unsympathetic character, and it would make sense to redeem her by placing her in a situation that is over her head, making her recognize that espionage should be left to the professionals. That never happens. Instead, she’s integrated more and more into the operations, and when it’s time to deal death there’s no pause for sober reflection. Sarah, like the rest of the characters, rarely ever feels like a real person in an unreal situation. Instead, she feels just as artificial and produced as the rest the film. This is a shame because she should represent the audience within the movie, trying to keep up with characters that are larger than life. As a result, moviegoers watch the fun without ever being part of it. The overall presentation of the film is largely incoherent, ranging from plot to tone. A character fakes his own death early on just to reveal to the world that he’s still alive a scene later. A villain saves a character from dying with his comrades just to kill him in a different location that is about to be obliterated. These actions and more aren’t motivated by any logic within the film, rendering them confusing. Furthermore, the majority of the film is rather subdued, with only a few showy bits here and there – which are sadly revealed in the trailers. While those moments are everything audiences want from this kind of film, this level of action absurdity isn’t maintained consistently throughout. Finally, the absence of any blood was a mistake. Unloading an entire magazine of bullets into a person or driving a knife into their body should produce a little red, but it never happens here, leaving audiences to fill in the blanks. With this trend of bloodless violence in film, a cinematic future where even the guns and blades have been removed and actors simply pantomime weapons in their hands is not unforeseeable. And yet, it’s hard to walk away from Red 2 not having been entertained. It moves at a nice clip, the aging actors are wholly believable in their action sequences, and the familiarity of the characters does offer a sense of visiting with old friends. 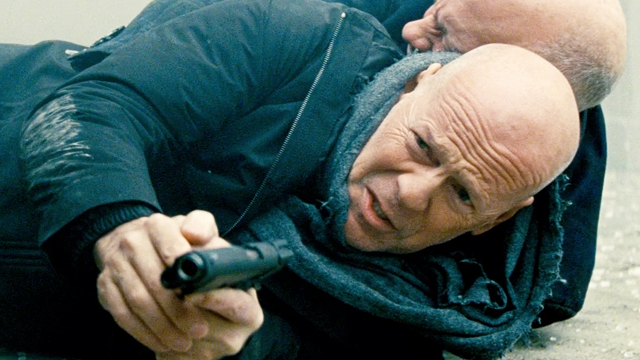 So while most viewers will not be disappointed by Red 2, it’s hard not to find the film fun, but forgettable.